My message at Eastbrook’s Christmas Eve services was entitled “The Gift We Really Need.” You can watch the video below or through the Eastbrook app, listen to it via our audio podcast, or read the entire text below the video. Join us for our next sermon series beginning in January, “Unschackled,” from the letter of the Apostle Paul to the Philippians. What kind of gifts do we want? Maybe you remember some of those things. You can’t wrap most of those things up and put them under a tree. It reminds us there are a lot of things that we want, but there are other things we know that we really need. What kind of gifts do we need? And here is what we discover fairly quickly: we cannot provide all of these needs for ourselves. It’s not something we can simply acquire – with our own resources, or our credit card or paycheck – but it must come from beyond us. Of course, this is where a lot of people begin talking about God. I met my friend Tom, whom I hadn’t seen in fifteen years. Tom was a hard-drinking, lovable partygoer who stopped going to church soon after college. Last year his live-in girlfriend decided she wanted to attend church because of some crisis she was going through. Tom reluctantly agreed. That morning he sat down and started playing his guitar. Thinking of church, he resurrected three hymns from his distant memory. “Those are beautiful—what’s the music?” his girlfriend asked. Tom explained the words to the hymns. They chose a church out of the phone book, and to Tom’s utter astonishment, that Sunday the congregation sang all three of those hymns. It so rattled Tom that he completely turned his life around. Listening to him tell the story, I couldn’t help laughing in surprised joy. I have a memory of Tom so drunk that he fell over….And now here he was, weeping, telling me how God had changed his life. Think of the “coincidence” of those three hymns being played the one Sunday that Tom dropped in to church. Was that a miracle? It was certainly grace. God’s grace is a gift like that, coming from beyond us, right into the place of what we most need. It comes in many forms all across the hierarchy of needs: material needs, relational needs, emotional needs, and spiritual needs. This is where the wonder of Christmas erupts into our world like a volcano of God’s unstoppable grace that we never expected. Other religions address the deepest human needs by pointing either to a God who is almost laughably human, as in the ancient Greco-Roman religion, or a divine essence that is increasingly removed from being human, as in the far-eastern religions like Buddhism. But the God of the Bible is not like that. God does not simply gives us gifts we need, but this God actually becomes the Gift we most need. Christmas is all about that. Jesus is, as one Scripture says, “the image of the invisible God” (Colossians 1:15). Jesus shows us what God looks like, acts like, speaks like, and loves like. The deepest human need undergirding all needs – whether basic needs, psychological needs, or self-fulfillment needs – is the need to connect with the divine. And only a hyper-personal God who relates to us as real persons can meet that need. Neither a god who is laughably human nor a god who is esoterically removed will work for this. Only a God who can show us what it means to be human from the inside will do. Only a God like Jesus will do. Think with me about Jesus for a few moments as this greatest gift of God for us. His death: not exactly heroic, but full of rejection, isolation, unjust accusation and suffering…things with which we all can relate. His Cross is the epitome of what the God of the Bible is all about: sacrificial love in real, rugged, flesh and bone entering the worst life can throw at us and bringing good life out of it; that’s a salvation, that’s deliverance, that’s healing, that’s gift. Here is the gift we most need at the hands of the only One who can provide it: God Himself. That one word description of the Messiah from the prophet Isaiah says so much more than we could ever fully understand: “the Lord himself will give you a sign. Behold, the virgin shall conceive and bear a son, and shall call his name Immanuel (which means God with us)” (Isaiah 7:14 & Matthew 1:23, ESV). This is God, who has come to live with us, Himself the gift we most truly need. 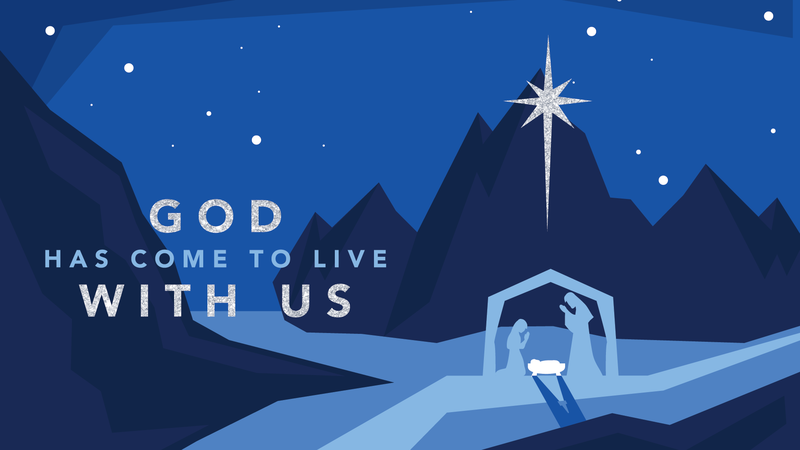 Here is the gift we really need: God has come to live with us. So, let me suggest a few things this Christmas Eve about how we respond to God. Look at the response card – don’t do nothing. Respond to the gift. “2017 Holiday Shopping Survey.” WalletHub. https://wallethub.com/credit-cards/?v=20#survey. “A Timeline of Top-Selling Christmas Gifts…Ever.” Esquire. http://www.esquire.com/lifestyle/g702/top-christmas-gifts. “Maslow’s Hierarchy of Needs.” Simply Psychology. https://www.simplypsychology.org/maslow.html.